"I have no words because this was so awesome!" and "Now I have to wait another year for the last book!" 1) I didn't want to read everything in one sitting and be left with that stupid empty void you get after finishing a great story. So I allowed other distractions to keep me at a steady reading pace, but every time I picked up that book, I just wanted to keep going until I finished and that whole "One more chapter then I'll go to sleep" mantra was really just standard hopeful drivel for my book reading marathon binges when I'm in love with the story I managed to get my hands on. 2) I won't deny that I might have let the expectations and my own hype of this book overwhelm me. A certain part of me was severely afraid that things would go wrong and I would end up disappointed. But contrary to that unfounded fear, book number two of the Grisha trilogy truly held up to all the expectations I'd put in place for it. I truly have no words. Or well, maybe I DO have a few (like I said...). The one negative I found is really my own personal bias. I'm hard-pressed to pay attention to things related to politics and war and so there was a section of the book where the war strategies and political controversies left me a little blah. But that's not to say that I didn't enjoy them or that it wasn't written well, because everything still progressed smoothly and wonderfully. I'm just a little less drawn to those things. In contrast, I had enjoyed Alina's growth into her powers and her journey of self-revelation in the first book, Shadow and Bone, a lot more. OMG, THIS BOOK WAS SO, SO AWESOME!!!!!! But I'm a rather monotonous and laid back person, so we'll leave it at that (loud CAPS and many exclamations points and all). Lastly, something I never got to do was review the first book since I finished it so quickly I never had time to put my thoughts together outside of those same few words in bold faced CAPS and exclamation points (see above). 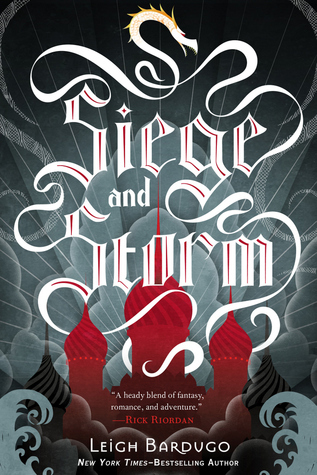 But the one thing I wanted to make mention, which applies to both the first and second book, is the world that Leigh Bardugo has created in the Grisha trilogy. There's nothing I love more than being able to pick out background bits and pieces and actually see a truly formulated world without even trying. If you kick the main characters out of place, that world still stands on its own with its own histories and lore and cultures. This, in itself is one of the most amazing things that a truly talented author is able to do. Too many times do you read through a lot of books only to find that the foundation is based so much on the immediate story and the main characters that if all of that were gone, the world would probably cease to exist. But with a well-developed world, you could throw anyone into it and still have a whole new and different story to tell. In fact, you could pick and choose from a lot of the side or background characters and see their entire story vividly. This is one of the things that I love finding out the most with a lot of authors I've come to love. That being said, along with the excellently created characters, the story progression, the writing, and the story itself, everything seems to be falling into place with the Grisha trilogy. I'm not even sure how I'm going to last the next year until the finale is released, because I'm already feeling jittery. Finally, if I loved the characters from the first book, I most definitely loved them even more with all this new development. Because these aren't static characters and their very human, ever-changing lives that show through in each subtle shift of the stories trajectory touches me. From Grisha, to royalty, to the Darkling (I maybe didn't favorite him as much as others do) as well as all the newest introductions, the world came together so cohesively that I rarely questioned the purposes of anyone at all. I loved the addition of Tamar and Tolya and the idea of rogue Grisha. It gave insight to human nature's rebellious instincts. Alina's continued struggle with her own personal demons as well as her hopes were satisfyingly bitter sweet. The loneliness she felt as well as the echo of her connection with the Darkling was wonderful. I love this girl for her strength, but at the same time, my heart hurts whenever she seizes the opportunity to be less than a saint. Her only hope is that she knows when her thoughts have gone dark and familiarly sinister, and yet at the same time, the humanly instincts of greed allow her to give into her less than noble intentions. Mal's conflicting desire to have purpose in his life, to remain by Alina's side, or to just give up his own hopes altogether really wrings the heart even more. If I thought he was just the lovelorn soldier pining after his first love with no other purpose from the first book, he really changed things around with a snarky yet charming personality in spite of his personal conflicts -- this boy has won my heart (but in his defense, he had very admittedly less scene-time in the first book than he did this time around). Even with little movement, he manages to tell you everything that's going on in his mind and makes your heart hurt for him at the same time, yet in some roller coaster instances, you continue to love him for who he is. And the addition of Sturmhond was just icing on the cake. As much as I loathe his bipolarism, his many masks and personas, I loved his charm, his wit, his resourcefulness, and yes, even his calculating schemes. This guy was pure awesomeness! As Alina had put it to Mal, "Do you practice being wonderful?" Because I'm sure his charming loveliness CANNOT be anything less than an art. Anyway, as always, what started off as a few words have become a longer post than intended. When will I ever learn that once I start charging into a review post, there is no way for me to keep it less than 1000 words? And now, I'm off to that horrendously LOOOOONG wait. In the meantime, at least I know there will be plenty of other "OMG I NEED THAT NEXT BOOK NOW!!!!" options awaiting me within the next few months. "I just pictured the Darkling being cornered by a sweaty duchess trying to have her way with him." Yes, Mal! This is why I love you so much! Witty, charming, and scandalous. Nikolai laughed. "Next time, bring a flask. Every time he changes his mind, take a sip." I groaned. "I'd be passed out on the floor before the hour was up." A drinking game! In the book itself! Legendary!